May we present: Furniture for small spaces – some very clever tables for the small apartment. When you want to live in a small apartment or tiny house, it’s a good idea to invest a little in furniture designed for small spaces. These are some of the creative solutions we have found, that we can recommend. Great design is timeless, and here are some good examples. The best piece of furniture for small spaces we have come across: A folding wall table, that hides away as a wall picture when collapsed! This folding wall table is so well done, and you have to look closely to notice, that this is not a regular picture frame. Murphy beds are great space savers for small homes. It’s traditionally a bed that folds away in a closet, but today the concept has been refined and redesigned over and over. You can buy this bed at $759 here incl. shipping. We love Murphy beds, and we also have one installed in our bedroom. We use it daily, and it’s a great way for us to be able to have a living room, a bedroom AND an office in our 430 sq.ft. apartment. We have featured these beds before – See more Murphy beds here. Just remember to create good circulation in the room for good air flow. You can e.g. install a heat pump, that will let your air circulate around, and add fresh air. Get it here for $258 with free shipping. This Nordic design is actually a lot cheaper than it looks. Scandinavia is well known for their design skills when it comes to simplicity, but they are also normally quite pricey. This one though is only $258. It’s wood and the dimensions are 30 inches x 42 inches x 42 inches. The 5 pieces fit well together, and they feel like one piece of furniture when the chairs are one place. This is a neat little table by Sculptures Jeux. It doesn’t take up much space when in collapsed mode, and when you have guests over – or you need more space – you just pull out all the extra leaves – and you instantly have five times the table surface available! The design is very simple and perfect for a small family, as the leaves are mounted in different heights. Perfect for a small space and tiny houses. The small holes in the table let air circulate, and is a great idea if you keep tea and other food stored inside the table. This one can double in size. The tabletop can be folded out to transform this table from a console table to a small dining table, that will do fine for smaller occasions. It is one of the more affordable collapsible tables. You can find it here at Expandfurniture at only $599. This is another one of our favorites. It so well designed and small when collapsed, and everybody is amazed when the magic unfolds! You just put a little pressure on the tabletop, and you can lift it up. It is piston operated just like an office chair, and the two leaves are hidden inside the table. Very clever and it’s too expensive either. You can find here at $1.695 besides some other cool tables. This table has some similarities to the one above, but with a more stylish and Scandinavian touch. It’s genius if you like to have magazines, books, laptops, or a carpet around the sofa area, as it has nice drawers with lots of space. 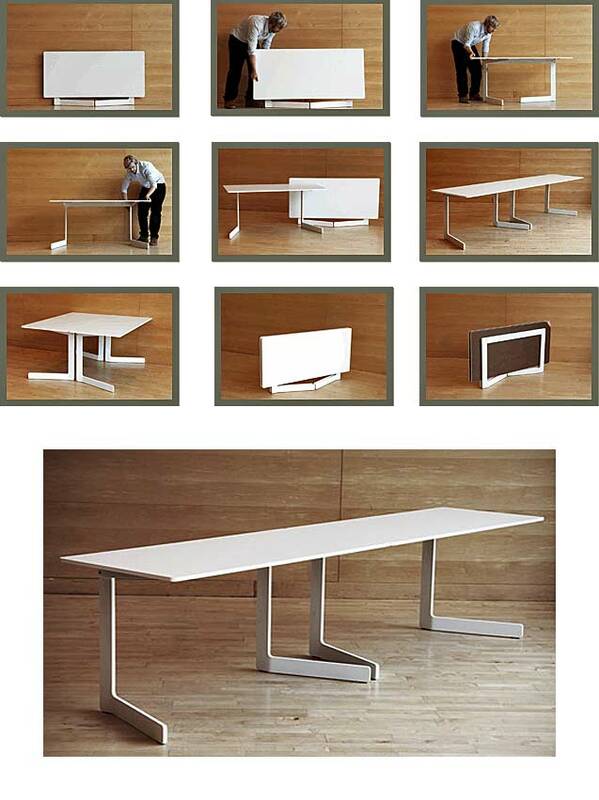 The F2 Table from Nils Frederking stands out as being one of the fastest tables to set up and fold away. You don’t have to store the extension leaves in separate places, because the extension leaves simply fold in together with the table. This table is great! When collapsed it can serve as a console table with e.g. a bouquet of flowers. When you pull the table out it can easily fit 10-12 people for a nice dinner night. We have only seen it online with free shipping here. Click here to read more about This table and the Goliath Table. (video post). This kind of table also fits well with the northern minimalistic style in modern homes today. E.g if you need to match it to the white lines of a heat pump, or if you have white electric radiators etc. This coffee table is really neat. If you (like me) likes to work from the sofa from time to time you will appreciate this sofa table. You can fold up a nice desk to hold your laptop and papers, and you can also store stuff like magazines, chargers or other good stuff in the hidden drawer. You can find it here for $995. This camping table is quite amazing. The camping community has developed a lot of great furniture that saves space, and this table is no exception. It even has a nice handle so it’s easy to carry it with you. These three tables/seats are really nicely designed – it doesn´t get more simple than this. It speaks for itself. When you have guests over and need extra seats, you simply pull out the two smaller parts inside the furniture. This Swedish design by Akka is beautiful, but also quite expensive. It can fold away to take up almost no space, and when fully extended it can fit up to 4 people on each side for working, or maybe 12 people for dinner. This table has storage inside and is a good way to hide some extra stuff inside your living room. It folds up beautifully and has a sleek design with a Scandinavian touch. You can get it here for $221 (including shipping). Pick it up at Amazon here. This is so well designed. Love the simplicity and the straight lines goes into this design. The stools also hold quite a lot of storage, a good place to store books, games, blankets, and other stuff you need in your living space. Great solution for getting that extra storage in the bedroom. It can easily hold all your clothes as well as bed linen, extra pillows etc. It comes in three different colors. This dark wood color, brown and a black. Once you are done ironing, you just flip the iron board to use it as a tall mirror, to be able to see if you missed a spot and to get dressed properly. It is designed by Aissa Logerot from France, and it definitely has that French retro feel to the design. For a classy European home, this will go very well with almost any interior and furniture, and the red color on the legs and the board is also a very sweet touch. For the small home, this is the ideal way to get a tall mirror into the bedroom. The tilting mechanism makes it perfect for couples as well, because you just flip the mirror if one is taller than the other. The only improvement you could wish for in the design of this ironing board would be if the legs could twist 90 degrees, so you could hide it behind a closet or place it flat under the bed. For a tiny house or a small apartment, this kind of multi-functional furniture is ideal. When you have downsized your clothes, doing laundry is no big deal. With this cool fold-down drying rack, you don’t have to store a separate drying rack in the closet. You simply pull down the blinds, and they turn into a perfect rack for drying your clothes. The design is created by Kim Bobin & Ko Kyungeun, and the rack it is perfectly hidden and double function as blinds when you don’t need to dry clothes. The designers actually won the Red Dot design award for this concept, and one can understand why it found favor among the judges in the competition. It fits perfectly inside the window frame, and as an indoor solution to drying clothes, it’s pretty neat – also when you consider the fresh air circulation you get, from placing your laundry in the window area. You might also get natural heat from the sun if you use the rack during the daytime, which will speed up the drying process. The pull-down mechanism is built into the window frame, to make it disappear completely. It’s super fast to pull down, and you don’t have to go to the nearest laundry place and stand in line, to be able to dry the clothes. It is a good fit for tiny houses, as you need to get very creative when you only a few rooms to store everything you need. The Berlin-based designer Tobias Fraenzel came up with this great idea for the small apartment space. It’s a ping-pong table hidden inside a door, and from one side it just looks like a door, while you can see the actual ping pong table on the other side. It’s a great gimmick for a young apartment space, where you need to utilize every square foot, and it’s a guaranteed hit among young friends. It only takes 5 seconds to fold down the table and get ready for a fun game of ping pong. You just push the lower part of the door forward with your foot, and pull down to swivel the table into position. The net is easily attached, and the door handle will be positioned close to the net, so it doesn’t interfere with the game. This will also be a great idea for the young office space, where you want an alternative to the classic soccer game. The price will keep you away though, it’s priced as high as $4,000, so not the ideal idea for the young studio apartment. You’ll probably want to build it yourself. The construction doesn’t seem too hard to figure out. With a little help from your carpenter friend, it should be possible to build a table like this during a Saturday or two. The Argentinian designer Aldana Garcia has come up with some cool ideas, which will add some extra space to the small apartment. The idea is basically to use the window area as extra space when you fold out the window frame to create a few extra square feet. It’s a great idea to use the space outside the window because space is very limited in the urban areas. Here you can see how the window will fold out, to add a couple of extra square feet to the apartment space. This allows you to sit and relax, and enjoy the view of this city. There are several design ideas, and none of those have been put into production yet. The designer is looking for investors and hoping to put some of the best ideas in the real world. We especially love this slide-out function, where you can actually sit “inside” or outside the window, and e.g. read a book, or just enjoy the view for a few relaxing moments. The idea above, will have to be a very solid structure, in order for someone to actually sit outside, and the idea below might be cheaper to implement in existing apartments in the city. Here you can see some of the initial ideas, from the designer’s hand. Who wouldn’t like to take a power nap here? This bed is simple and stylish. So simple you can make it yourself. It’s designed by Hertel Klarhoeffer, a German designer from Berlin. The bed is a two-part bed that will either stack to fit one person or is a nice American twin-size bed. It’s a great way to hide an extra bed, so you have an extra sleeping spot. The system will stack without the use of any tools or hardware, simple and easy. When stacked it is 16.5″ tall (42 cm) + 2.0″ (5 cm) mattress. It’s a nice fit for a couch, and you can use it in the living room of a small apartment every day. Whenever you have guests staying over, you just fold it out to accommodate a sleeping space for two persons, whether they’re a couple or not. We have a lot more ideas for space saving beds here. As you know we love folding furniture, and this table/shelf unit is no exception! It’s a table that folds from vertical to horizontal position, and you can keep everything in place, as long as there are no tall items. The construction is made from wood and steel, and it can be operated with one hand in one single movement. Let’s look at some more pictures. The transformation only takes a few seconds, and the cool part is definitely that you can keep everything as it is, when you want to remove the table and turn it into a shelf unit, or vice versa. It’s a German design and the system can be found online at germansmartliving.de at 899€. The model is called Swing. 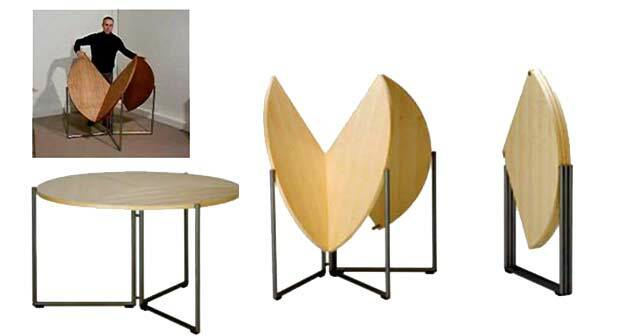 It has wheels under it, so you quickly can place it up against the wall, when dining is over and you want to turn the floor into a dance floor. It comes in six different variants, and two variants are for outdoor use. The table was presented at the IMM Cologne 2018 furniture show. The shelves are made from oak wood and the frame from black lacquered steel with embedded casters. Hobbies like sewing can be difficult to fit into a small apartment space. This piece of furniture will help you fit everything in one closet, with easy access to the sewing machine. If it takes several minutes to pack everything out every time you have an hour to work on your hobby, too often it just doesn’t happen. It has to be easy and quick to get started, and that’s possible with this beautiful piece of furniture. This unit has lots of shelving space, which is important for most hobbies from fly tying to sewing. When you are done, you just pack everything away, and within seconds you are ready to use the same space for something else. The back of the closet has a hole for the cord, so you can have the sewing machine plugged in and ready to roll instantly. A nice touch. I have filmed and interviewed tiny house people and RVers since 2011. I love sharing ideas and inspiration about tiny living and space saving furniture. I have completely rebuilt two RVs (vintage & new) over the last couple of years and love to travel for months at the time in our family RV with my wife and our kid.